The Serbian Royal Academy (SRA) was established by the Basic Law on the Royal-Serbian Academy, adopted by parliament and proclaimed by King Milan in Niš on November 1 (November 13, New Style), 1886. The first academicians, 16 of them in all, were appointed by the King on April 5, 1887. The Academy comprised four departments with four full members each. The first President of the Academy was Josif Pančić and the Secretary was Jovan Žujović. Operating procedures, adopted in 1887, provided for secret voting and a two-thirds majority for the election of new members. 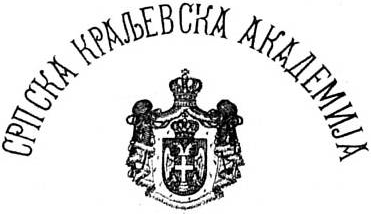 The Serbian Learned Society and the Serbian Royal Academy co-existed in the six-year period between 1886 and 1892. The period was marked by frequent disputes between the two institutions. In order to ensure continuity of work for both of them, it was proposed that eight candidates for Academy membership be selected from the Serbian Learned Society and that all the other SLS members (full, corresponding and honorary) become honorary members of the SRA. A novelty in the work of the Academy was that systematic scientific research projects were initiated. One of the major undertakings related to the study of the people and folk life was carried out by the Ethnographic Committee. Academicians Jovan Cvijić and Jovan Erdeljanović set down methodological instructions and launched the scientific series called Srpski etnografski zbornik: Naselja i poreklo stanovništva (Serbian Ethnographic Collection of Papers: Settlements and Origins of Populations) and Život i običaji narodni (Folk Life and Customs). Academy members published their works in Glas Srpske kraljevske akademije (Voice of the Serbian Royal Academy), which came out as two editions: one contained natural science treatises and the other treatises in philosophical, linguistic, legal and historical sciences. The year 1931 saw the launching of the publication called Bulletin de l’ Académie des sciences naturelles et mathématiques, which later also featured supplements dedicated to philosophical and social sciences (1933).